Dr. Rock's Blog & Roll: Album of the Day: The Monkees (4/22/68) 42 Years! Album of the Day: The Monkees (4/22/68) 42 Years! For most people, The Monkees will forever be the teen/pop, made-for-TV band that could barely play their assigned instruments and would never have existed without the faceless session musicians and backroom songwriters who created the music behind their vocals. In reality, that’s an exaggeration. Yes, the band was assembled from a casting call for the TV show, and yes, their first two albums were largely performed by session players with vocal overdubs. But in 1967 the band released two well-received LPs (Headquarters and Pisces, Aquarius, Capricorn & Jones, Ltd.) on which they played, sang and wrote most of the material. Mike Nesmith, Mickey Dolenz, Peter Tork and Davy Jones had far more musical talent than they’re usually credited with, especially Tork (folk guitarist prior to the Monkees) and Nesmith, a songwriter (Ronstadt’s hit “Different Drum” and several Monkee B-sides) and solo 1970s country-rocker. After demanding and receiving control over Headquarters and Pisces…, their cohesiveness splintered as each member sought independence to write and produce his own material within the context of the band. 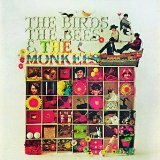 The result was the April 22, 1968 release, The Birds, The Bees And The Monkees. While it sounded much like a typical Monkee record, it was an amalgam of songs produced and recorded separately by the four members using different backing musicians at different studios. Despite its origins and its aftereffect (a disillusioned Tork left the Monkees later in 1968), The Birds… became a gold seller with the hits “Daydream Believer” and “Valleri.” Nesmith is credited with four of the twelve tracks, including the delicious “Tapioca Tundra” (a precursor to his future) to offset a couple of syrupy Jones soft rockers. The Monkees are in Playlist Vault and The Birds… is available from Amazon and iTunes.